A few weeks ago, the first TNT2 boards were just being released and Leadtek was there with the first boards. Leadtek is a relatively unknown manufacturer, especially in the retail market, but having the first TNT2 really helped put them on the map. Now everyone is wondering about this card. Will it still be as popular when other TNT2 solutions start popping up? Well, let's take a look. 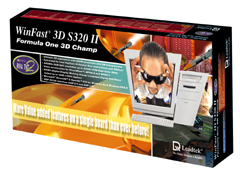 Available with 16MB SDRAM or 32MB SGRAM, all S320 II models include TV-out. Models with the "Pro" suffix attached to the name include the optional DDWG (Digital Display Working Group) compliant Digital LCD Flat Panel output interface that supports resolutions up to 1280x1024. AnandTech's review unit was not a Pro model. While the first parts are not surprisingly non-"ultra" parts, Leadtek has done some work to make their regular TNT2 a bit more appealing.